Parking in the Rear of Building or during Art Show Openings park a half block North on State St. in the Train Station Parking Lot. Do not park in neighboring business lots. 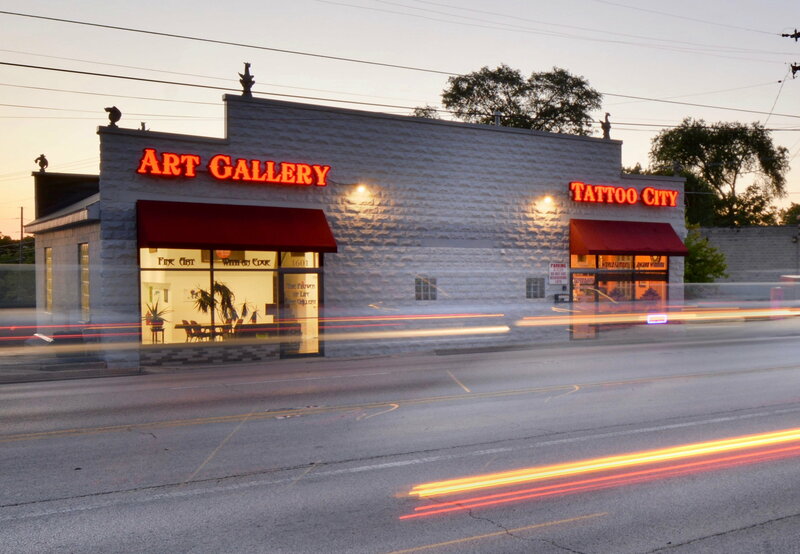 The Flower of Life Art Gallery was established in April of 2013 and opened alongside and in conjunction with the new location of the World Famous Tattoo City - Skin Art Studio which has done business in Lockport since 1994. The gallery holds several group art exhibitions each year featuring talented artists from around the globe. Some of the galleries proceeds benefit different local charity organizations so we can help support our neighbors in need. The gallery hosts shows for the Artist Guild of Lockport (TAGOL) several times per year. We host painting parties and art classes several times per year that are open to the public. Seating will be limited so register fast. See Classes and Parties for future events.